Overseas nurses applying to work in the UK will no longer have to re-sit an entire competency exam if they fail only part of it. From this week, candidates for the mandatory Objective Structured Clinical Examination will only have to retake the sections of the test that they fail. Station 1 - Assessment. Establish a rapport with the patient and record observations using verbal and non-verbal communication based on the 6Cs. Station 2 – Planning. Write down two relevant aspects of care based on the assessment from station one. Station 3 - Implementation. Ability to implement nursing care, such as administering drugs. Station 4 - Evaluation. Write a transfer/discharge form based on the previous scenarios. Stations 5 and 6 – Clinical skills. Candidates are tested on two skills from a pre-set list, such as vital signs, intramuscular and subcutaneous injections, basic life support, safe disposal of sharps, and wound care. 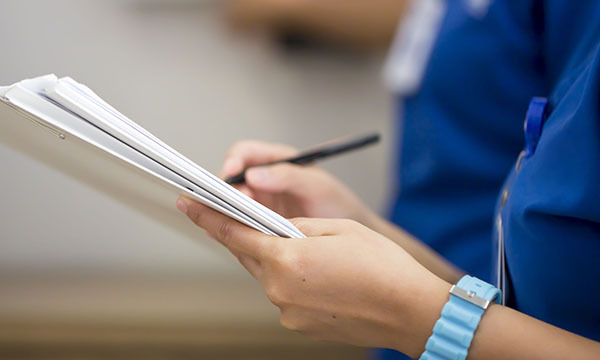 The exam is part of a series of requirements that nurses who have trained outside the European Economic Area (EEA) have to complete before they can join the Nursing and Midwifery Council (NMC) register. It covers clinical and communication skills among other areas. Previously, candidates were not told which of the exam's six sections they had failed or why, while employers would have to foot the bill of almost £1,000 for the nurse to retake the entire test. Now non-EEA nurses will be told which part they need to repeat, and the cost of retaking it will drop from £992 per candidate for the full test to £496 for a partial re-sit. Recruiters say the changes, to be further discussed by the NMC council at the end of the month, will reduce stress for nurses and save time and costs. Adult nurse Febin Cyriac is business development manager for the registered nurse recruitment firm Envertiz Consultancy. He said: ‘This is a welcome change, which I believe will reduce recruitment costs. He said the exam had made the UK an unattractive destination for nurses. Pass rates were poor and many candidates regarded the exam as a money-making exercise, he said. Mr Cyriac said it can cost employers £8,000 to £10,000 for every overseas nurse they employ once other tests – such as the International English Language Testing System – and NMC application fees were included. Since April 2017 non-EEA nurses can sit the exam up to three times as part of a single application to the regulator. Failure results in the NMC closing the application, requiring the process to start again and forcing the nurse in question to wait six months before the first of the three further attempts can be taken. Home Office immigration rules require non-EEA nurses to acquire their NMC pin number within eight months of arriving in the UK or their visa can be cancelled. There are three NMC approved test centres: Oxford Brookes University, the University of Northampton and Ulster University, each of which hold tests four times a year. NMC figures show 1,499 of the exams were taken in the January-March quarter of 2018, with a pass rate of 51%. Only 377 or 41% of the 920 candidates passed first time. The NMC confirmed that the rule on re-sitting exams is one of a number of changes it is making in how it handles the registration process for staff from outside the EEA. It is expected to provide an update at its next council meeting on 25 July.